At rtCamp, we sell WordPress products and over the last few months, we have been working on improving how we give support to our premium customers. A big part was to create a solution inside WordPress, so our developers who gave support did not have to use a 3rd party solution. 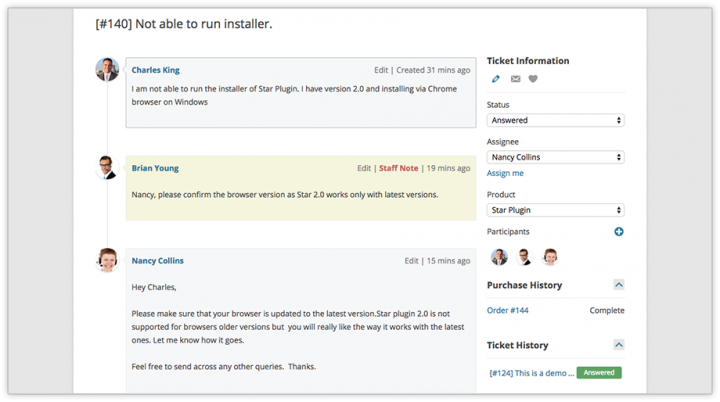 Today, the project is mature enough for us to proudly introduce it as a WordPress premium plugin. Who might like to use rtBiz Helpdesk? If you have a WordPress site, run an e-commerce business using WooCommerce or EasyDigitalDownload and want to have a Helpdesk plugin that integrates with your product list, order numbers and customers – rtBiz Helpdesk should interest you. You can install rtBiz Helpdesk Installation on your WordPress Dashboard, just like any other plugin. It has a easy setup wizard will make this installation quick and easy. Almost everything about this plugin has the WordPress feel to it. So if you are familiar with WordPress, you will find all features and interfaces extremely easy to recognise and work with. rtBiz Helpdesk seamlessly integrates with various sections of these two plugins. So as an Admin you will find ‘tickets’ references across various backend sections.Your customers will have quick options to create tickets and see the ticket they have created. Replying to questions or tickets created by your company becomes a lot easy when your support staff can simply use the front end of the ticket instead of the dashboard. Also you can add others to the ticket, write a comment thats available only to the staff along with seeing a summary of the customer’s purchased products. You can configure multiple mailboxes for different products, enable reply via email and tickets can be created using a particular email address and email notifications on tickets are created. You can add any number of users to this Helpdesk. There are no upper limit for number of tickets, customers or products. The introductory price is $19 USD for a single site license. The costs includes support. Try out rtBiz Helpdesk at the Demo website.